The CEO designate position is a 12 month development role during which Young will receive on-going professional training and support from FIFA and Oceania Football Confederation (OFC). Originally from Faatoia and Vaiala, Young has recently returned from Washington DC with wife Kelleah and their two children. “After living in, and travelling to, different places around the world I have come to realise that Samoa is the best place to live and raise a young family,” said Young. The 32-year-old is a graduate of the National University of Samoa and also holds an MBA from the University of the South Pacific, Fiji. His considerable experience lies in finance, marketing and strategic planning and coupled with his passion for sports these skills will be extremely valuable to FFS during the extended normalisation period. Young says he very excited to be building on the excellent work started by his predecessor Tuaa. “My vision for FFS is to continue to have a well-oiled administration that will develop football in Samoa and take it to its highest level. I am honored to be a part of a world-class team at the Football Federation Samoa. This year will be an exciting one for us and I look forward to working with my colleagues,” said Young. Neighbouring American Samoan CEO Tavita Taumua will mentor Young as he takes on the role. Taumua is an established Samoan CEO who has successfully guided FFAS through the normalisation process. 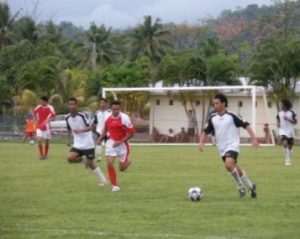 Tuaa took on the challenging task of reorganising Samoan football in February 2009 after the association began FIFA normalisation in December 2008. Under his guidance, the Federation has made significant progress. Facilities at the J.S Blatter Football Complex, Tunanaimato, have been successfully renovated with the re-opening of the number one football pitch and development underway on the fourth field. Key administrative roles have also been filled and competition is now underway. Tuaa says he has confidence that Young is the right man to continue rebuilding Samoa football’s competitions and administration. “Fred will be an asset to Samoan football. He brings the skill set required to continue the progress for FFS and to take the sport to the next level. He will be given all the professional training needed to establish himself in the CEO role. I welcome Fred and wish him all the success,” said Tuaa. While Tuaa currently holds the role of Interim Chairman of the Normalisation Committee, current Vice Chairman, Toetu Petana will step into this role upon Tuaa’s departure next month. “Toetu has been such a great support to me since I arrived in Samoa. We have faced many challenges and Toetu has always been there to support me. Not only have we worked well together but we have also forged a very good friendship. Toetu’s appointment to Interim Chairman is well deserved and I know that together with Fred Young they will continue Samoa’s progress,” said Tuaa. Young and Petana’s appointments emphasise the OFC commitment to re-establishing Samoan football with local people in control.